Semi finals: Jo Edwards (New Zealand) bt Colleen Piketh (South Africa) 21-17, Laura Daniels (Wales) bt Kelly McKerihen (Canada) 21-13. Finals: (gold medal) Edwards bt Daniels 21-17, (bronze) Piketh bt McKerihen 21-17. 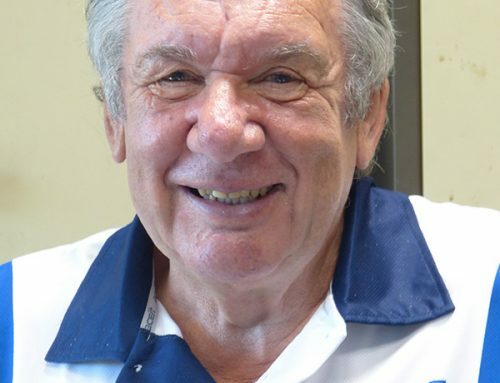 Semi finals: Scotland (Paul Foster, Alex Marshall) bt Malta (Shaun Parnis, Brendan Aquilina) 18-8, Wales (Daniel Salmon, Marc Wyatt) bt Cook Islands (Aidan Zittersteijn, Taiki Paniani) 21-14. 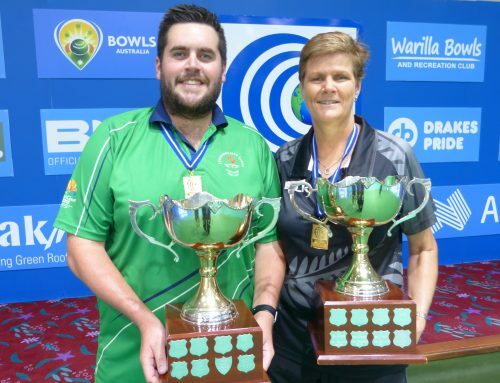 Semi finals: Scotland (Ronnie Duncan, Derek Oliver, Darren Burnett) bt Norfolk Island (Teddy Evans, Phil Jones, Ryan Dixon) 20-8, Australia (Barrie Lester, Nathan Rice, Aron Sherriff) bt Canada (Chris Standyk, Greg Wilson, Cameron Lefresne) 20-5. 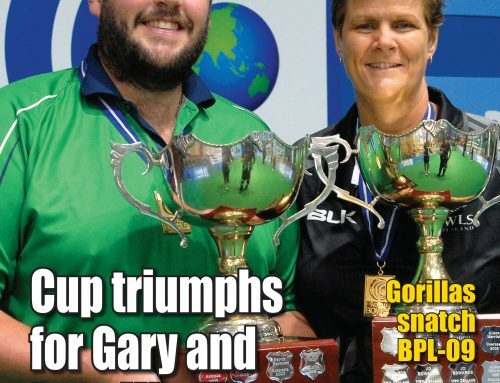 Finals: (gold medal) Scotland bt Australia19-14, (bronze) Norfolk Island bt Canada 19-16. 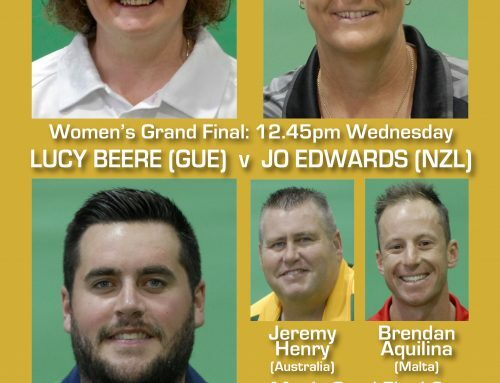 Semi finals: South Africa (Esmé Kruger, Nici Neal, Anneke Snyman, Elma Davis) bt Malta (Rebecca Rixon, Rosemaree Rixon, Connie Rixon, Sharon Callus) 14-8, Australia (Kelsey Cottrell, Carla Krizanic, Bec Van Asch, Natasha Scott) bt Canada (Jackie Foster, Joanna Cooper, Pricilla Westlake, Leanne Chinery) 10-9. Current standings: Australia 9 points +39 shots, South Africa 9 +5, Scotland 6 +7, Wales 6 +1, New Zealand 3 -22, England 3 -30. Current standings: England 10 points +13 shots, New Zealand 9 +36, Australia 9 +21, South Africa 4 +6, Scotland 3 -5, Wales 0 -71. 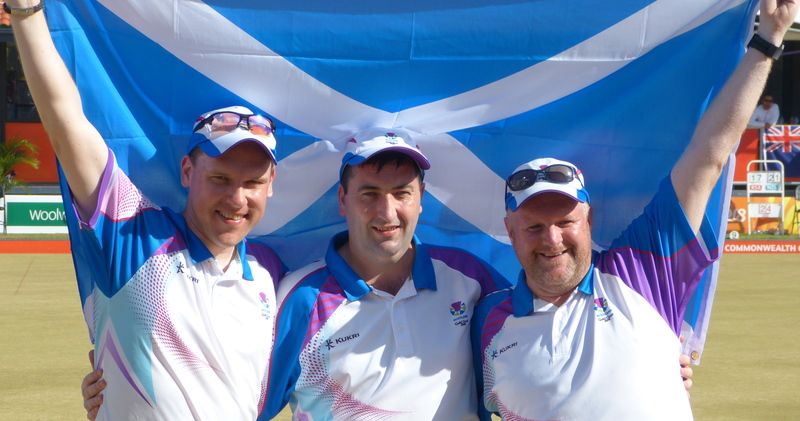 Photo: (a) Men’s triples gold medallists: Ronnie Duncan, Derek Oliver and Darren Burnett from Scotland. 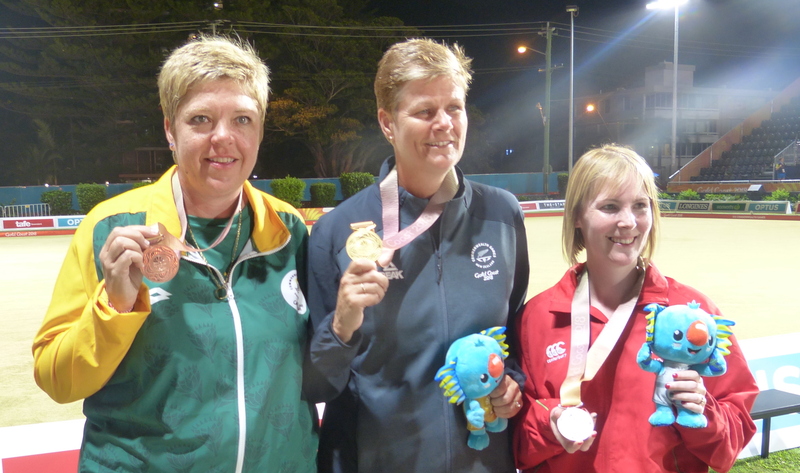 (b) Women’s singles medallists: Colleen Piketh (South Africa) bronze; Jo Edwards (New Zealand) gold; and Laura Daniels (Wales) silver.